fordie's blog – I wonder whether I'll start blogging again? I wonder whether I'll start blogging again? For the past 11 years I have run events in Worthing for what you could loosely call the digital community. Many other people have helped along the way, but for the past couple of years it’s been John and I running WorthingDigital. WorthingDigital has grown to a meetup.com group with 528 members. This growth is down to our curiosity about who else is in the town doing similar things to us & wanting to get to know them. We do this by running events that appeal to a broad range of digital folks. We tend to live in silos, but We’ve found that running a community group is a pretty effective way of breaking the silo walls down. I’m excited to announce that we’ve appointed a WorthingDigital committee who will help us to grow and improve & reach a more diverse membership. Looking at other local towns I noticed that there aren’t really any groups doing similar things to us, and where groups do exist, they’re not always easy to find. Where no groups exist, find people interested in digital, connect them with others in their area and encourage them to work together to build their own local communities. We already have groups in Worthing, Horsham & Hastings. We’d love to have you involved too, why not join your local group or start your own? 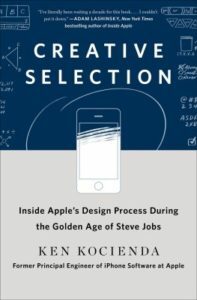 On my dog walks over the past few weeks, interspersed between my usual mixture of podcasts and 90’s techno I’ve been listening to Ken Kocienda read his book “Creative Selection – Inside Apple’s Design Process During the Golden Age of Steve Jobs” on Audible. In a lot of ways I think this book should be required reading (or listening) for anyone involved in designing or managing products. Listening to books like this means I can consume them while doing something else that doesn’t require too much brain power (like walking) and hearing the author’s words in their own voice adds something that you don’t get from ink on paper. That said, there was a lot to take in in this book and I came away thinking that I need to give it another listen for it all to sink in, or maybe even read the print edition. I think I’ll wait for the paperback. A while back I did a very silly thing. Well, actually I did a series of things that all seemed perfectly sensible at the time but the upshot was a bit of a disaster. I started this blog way back in 2006 and over the years I accumulated over 100 posts, which is not a lot compared to many people but they represented a fair investment of my time over the years. A couple of years back I decided that I would migrate away from WordPress and go to Ghost, a shiny new node.js based platform. The idea being that I’d blog a bit more and learn about node at the same time. The migration to Ghost went smoothly enough, but in the end the blog just ended up languishing. I decided not to bother to continue paying for Ghost hosting and eventually the ghost version died. “No problem” I thought, “I’ll just reinstate the WordPress version on Dreamhost”. I can’t be sure exactly what happened, but somewhere along the line I either overwrote the old version of my database, or it had already been deleted. Whatever the cause, I had lost all of my old posts and I couldn’t find any backups to restore from. I did some swearing. Then it dawned on me… archive.org have archive copies of my site. Slowly and painfully I managed to get all my posts back and they’re all on this site in glorious technicolor for you to enjoy! A lot of the links will link to web archive and some of the pictures are hot linked from there, but for the most part all of the content and categories are still available. I didn’t bother bringing over any of the comments. So thank you Archive.org! A small PayPal donation is on its way to you. Part one – what’s on my wrist? I do love my gadgets, and one type of gadet I’m especially excited about at the moment is wearables. I’ve tried a few different wearables and use a couple every day – I thought it might be interesting to talk about what I use, what else is available and what’s just around the corner in the world of wearable technology. I’ve had my fitbit flex for nearly two years – it’s a fitness tracker, primarily used for tracking how many steps you take in a day but it can also track your sleep. Initially, I just tracked my steps & occasionally sleep purely for my own curiosity, much the same way that I scrobble all my plays from Spotify to last.fm or track all my movement on Moves. Not because I had any particular use for the data, but simply for the sheer geeky thrill of knowing the data was there. Last year I bought a Fitbit Aria WI-FI Smart scale which I’ve been using to track my weight. I won’t bang on about it to too much now, but think that this is the device that’s had the biggest impact on my life recently. Because the scale uses the same app as the fitness tracker the tracker’s stats have come to play a far more important role in my life. The Pebble is probably the first true smart watch. I backed the initial kickstarter campaign and have worn my pebble practically every day since it arrived. I love the fact that I can just glance at my wrist to see notifications from my phone, accept or reject calls and control music on spotify. Pebble’s sport app works nicely with Runkeeper, so when I go out for a run I can see my elapsed time and pace at a glance which is great. Battery life on the pebble is incredible, after two years of use I still get nearly a week’s worth of use out of a charge, imagine getting that from a phone! Pebble enabled a feature several months ago which allows app developers to write pedometer apps using the watch’s internal gyroscope. Theoretically I could stop wearing my Fitbit flex and use the Jawbone or Missfit app instead. The only thing stopping me is how well the Fitbit Flex & Aria work together. Frustrated that my business bank debit card was not contactless, I decided to order a bPay band from Barclaycard. Essentially it’s a rubber strap you wear on your wrist which contains a miniature pre-paid Barclaycard. I was quite excited about the prospect of using it instead of a debit card to pay for my lunch and to replace my Oyster card on the underground. Unfortunately there is a bit of a drawback to the bPay, it’s huuuuge. I’m not kidding. I have quite large wrists, but the band was too big for me, it was uncomfortable to wear. I never even bothered registering it. imagine the pain problem for the designers of the bPay is that it actually contains a miniature debit card, about the size of a Tesco club card keyring. Why they couldn’t just embed the chip & NFC antenna in the rubber without the need for the card I don’t know, but they would have been able to reduce the dimensions of the band considerably if they had. I had high hopes for this dumb wearable, but it fell at the first hurdle. It’s just not wearable. In the last few years my enthusiasm for blogging had dwindled to the point where I’ve only posted twice in four years. I’m hoping that’s about to change. I always leave Full Frontal pumped up and full of ideas, and this year was no exception. I left with a mental list of things I want to play with or do; getting back into blogging is the first of these. Hannah Wolfe gave a very interesting talk about open sourcing Ghost, a node based blogging platform that I backed on Kickstarter. It reminded me that I should really pull my finger out and take Ghost for a spin, so I’ve imported all the posts from my old WordPress based blog and moved across to fordie.uk. It’s a start, I hope I can maintain a bit of momentum. Next up (hopefully) a couple of posts about the internet of things, starting with wearables. I’ve liked Nokia phones ever since I got my first mobile, an analogue Nokia 1000 back in 1993. I stuck with them for over a decade, while my other half flirted with Motorola and Samsung. At the time nothing beat Nokia’s build quality or the ease of use of the Symbian operating system. But I wanted to do more with the device I was lugging around. In 2004 Symbian was starting to look a bit dated and limited. I decided to try Windows Mobile and bought an HTC device, the “i-mate Jam” or “the ponce pad” as my wife liked to call it. I liked Windows Mobile so much that next two phones ran on Windows too. Then I got bitten by the Apple bug and switched to the iPhone 4 as soon as it was available on Vodafone. I currently have an iPhone 4s. 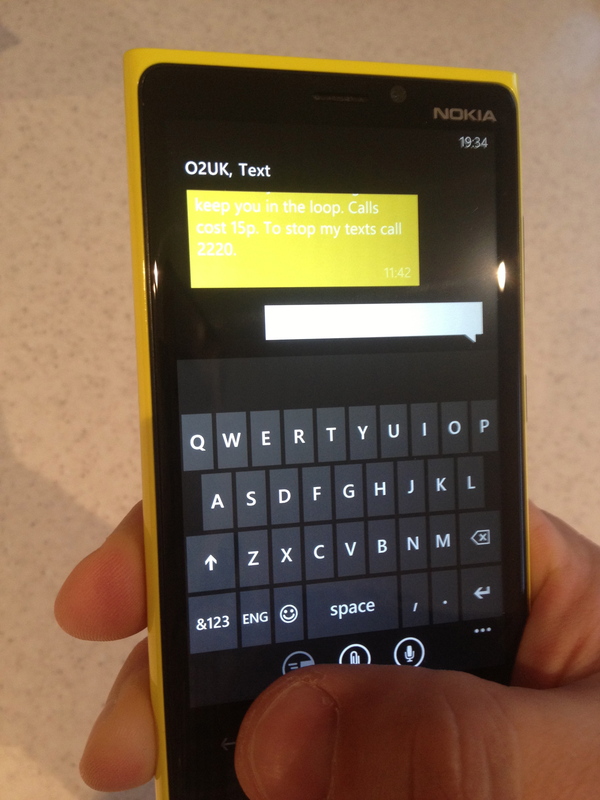 I was pretty excited when James told me that Nokia were looking for people to try the Lumia 920 for a month, and chuffed when Nokia asked me to take part. I really hoped that “Nokia + Windows Phone = WIN”. The Nokia Lumia 920 feels very well put together. Its body is plastic but it’s solid, it doesn’t feel cheap at all. There are three physical buttons down the right hand side, a volume rocker, the power button and a camera shutter button. Having the power in the middle seems a bit weird, but you get used to it. Beneath the screen there are three virtual buttons: Back, Windows & search. Like the iPhone, the 920 has no removable battery or external storage, but neither of these things are too much of an issue. The Lumia is large. You certainly know you have it in your pocket. It has a lovely big screen which is great for video. While the screen is certainly very attractive it’s also the biggest issue when it comes to the physical usability of the phone. Despite being averagely endowed in the hand department I found that I couldn’t comfortably type on the 920. Letters towards the left of the keyboard (particularly Q) and the back button were just a bit too much of a stretch. I got thumb-ache if I tried to text or email too much. I didn’t get sent a SIM card until nearly 2 weeks in to my trial, so evaluating the phone while out and about was initially quite tricky. When I did get connected the Lumia worked fine as a phone, voice calls were as clear as they are on my iPhone. The messaging app was OK… I didn’t use it a great deal and I missed some of iMessage’s features. The ability to continue a conversation you started on your phone on your Macbook or iPad is something I’ve come to take for granted. At one point the phone just stopped responding. I thought the battery had died & put it on charge. When that didn’t work I emailed Nokia, thinking the phone was dead. It turned out it just needed a “soft reset” but I lost a weekend testing. Nokia primarily wanted me to evaluate the Lumia 920 as a work phone, so that’s what I set about doing. I’m a web developer and don’t really spend any time in Microsoft Office (a mobile version of which ships with the phone). I mainly use my phone for keeping in touch using messaging, email & Twitter. I use my iPhone for testing web pages from time to time using Adobe Edge Inspect. Adobe don’t currently have a client for Windows Phone 8, so I couldn’t do that. Windows Phone is interesting. The home screen looks very pretty, I liked the fact that it was set up to use the yellow theme (matching the phone’s body colour). The large tiles are great, allowing you to see what’s going on with your apps without having to launch them. This is definitely a feature Apple could borrow for the next version of iOS. The way that Windows & Windows apps show you that there is more content either side of the panel you’re currently viewing, cutting off the heading text and showing a slither of the adjacent pane’s content is pretty neat too. The People Hub or “Me” tile on the home screen allows you to see the latest updates from Facebook & Twitter in one place, as well as your Outlook.com email (if you use that). It’s nice to be able to see those updates at a glance, but I found replying or posting my own updates through that route clunky and ended up installing the Twitter & Facebook apps. 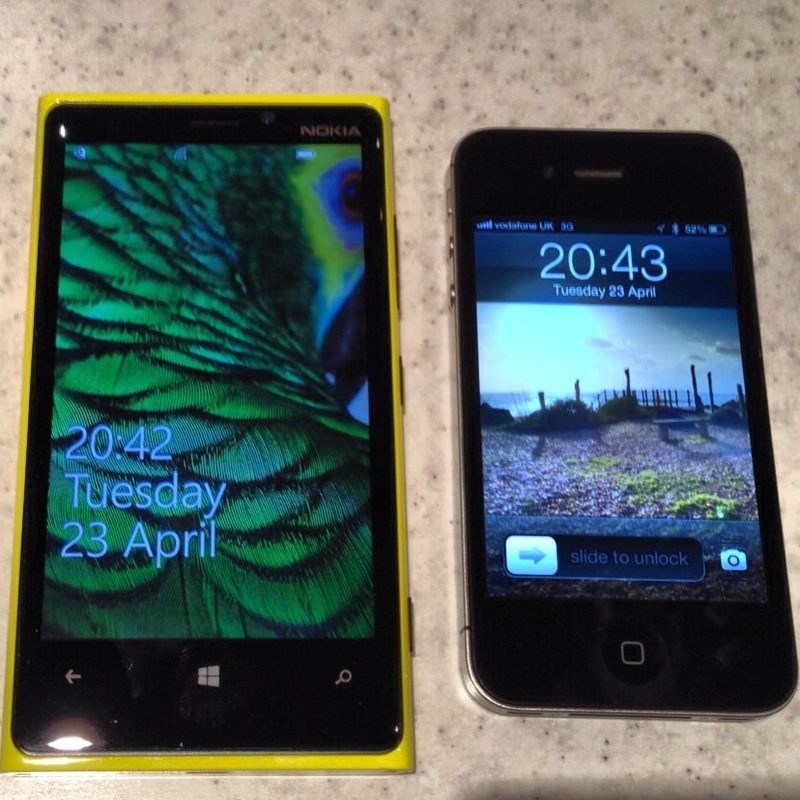 The flatness of Windows Phone 8‘s the design does mess with your head after a while. It’s often hard to tell read & unread items apart. There is very little to visually separate items when you start using the messaging and email apps. I dare say this is something you get used to. Many of my favourite iPhone apps like Instagram & Tweetbot are not available for Win Phone 8. Twitter’s Windows app is OK, but I didn’t have my blocked keywords & hashtags or sync my timeline between devices. Where there were Windows versions I often found some of the features were missing. For example Spotify doesn’t scrobble from Windows Phone 8. On the other hand, Foursquare on Windows Phone is exceptional. It’s really pretty, well executed and a joy to use. I don’t want to sound too down on it, the Lumia 920 is a really great phone and I liked it a lot. Windows Phone 8 has some really nice features, some of which I’d like to see in iOS. But it feels like the first version of a product, it needs refinement. The same goes for the third party apps, most of them just weren’t as polished as their iPhone cousins. For people that don’t already have a smart phone and those who really love Windows or Office it’s probably an excellent choice, but as someone who’s really invested in the Apple ecosystem it’s not for me. I don’t think I’m a naturally grumpy person, but there are somethings that I just don’t understand that bring out my inner curmudgeon. My feelings about sport pretty much match the way I feel about religion: Practice it & enjoy it if you want (though for the life of me I don’t understand why you would), as long as you don’t force it in my face and it doesn’t cost me anything… fine. Why does anyone care about this stuff? I can run a bit, swim a bit and throw things a bit but I wouldn’t expect anyone else to be interested in how effectively I can do those things. Hell, I don’t even care. Why an adult would want to watch some other adults trying to get from one place another quickly is completely beyond me. Watching a kids sports day is one thing “awww, bless… little Johnny managed to do the sack race without falling on his nose.” but if the only thing someone is any good at by the time the reach puberty is elegantly falling in to a swimming pool, we should be asking ourselves how the education system was allowed to foul up so badly, not celebrating it. I’m proud to be British, as a nation we have much to be proud of. We’ve given the world a model for democracy, the World Wide Web, marmite and much more besides. The idea that someone can represent their country by running round in circles seems completely barmey to me. Besides, it’s not actually about the sport. I hear Jessie J sang “price tag” at the closing ceremony last night. I’m sorry love, you’re wrong… the money is precisely what it’s all about. Coke, Lloyds and Visa didn’t sponsor the Olympics because they love you, they did it because the recognise that they can make a ton of cash of the back of it. Now I have absolutely nothing against corporations making tons and tons of cash, the Olympic tax breaks didn’t even upset me all that much. The thing is this: do you think those megacorps would have put money in to the Olympics if they thought they could fleece the public for the same amount of dough with out having to pay for some shell suited people to mince about a stadium? Of course they wouldn’t. I’m particularly pissed off about Lloyds, as a public owned bank they should be nowhere near things like this. In a 24/7 news cycle driven social media world the Olympics have been almost impossible to avoid. It didn’t matter how many filters I set up in tweetbot I was still subjected to a multitude of tweets about the games. Facebook has been full of it and the media, well… We have dozens and dozens of radio & TV channels some of them (Sky Sports News & Five Live for example) are even dedicated to sport. Why then did the Olympics get front page billing on the main BBC News website? Why has it entirely taken over the TV & Radio schedules? My two favourite shows on Radio 4 (Today & PM) have been pretty much unlistenable for the past few weeks because there’s been so much Olympic nonsense on them. Is it really that unreasonable to expect sport to be kept to the sports channels? They were still harping on about it on Today this morning; it’s finished now, shut up about it! 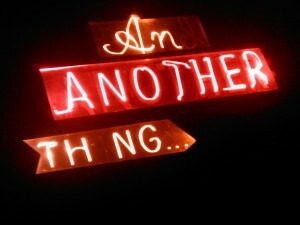 The last thing we need is 2012 becoming the new 1966. To rebalance things, I propose that BBC Parliament, NASA TV & coverage from CERN be allowed to dominate the schedules for the next few weeks. I could get really, really ranty about the cost to the tax payer, but I shall simply say £9.3bn is approximately £150 per person in the UK. That’s per person, not per tax payer. Think of the good that money could have been used for. Any way, that’s my rant. Let’s all agree to never speak of this again. Phone App Developers, lend me your ears! iOS developers are enabling users to get more and more out of their iPhones & iPads. But I think developers are missing one important thing that could make life easier for thousands of users. I’m not exaggerating. I have a particular bee in my bonnet when it comes to accessibility, my wife is registered blind and I am constantly frustrated when she is unable see things (like text on a screen) especially when I know that this is avoidable. It was this frustration that prompted me to email Steve Jobs about the iPhone’s SMS functionality last year. 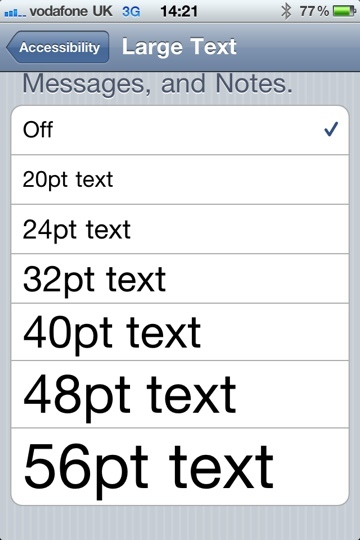 True to his word users can now change the font size for those 2 apps. What I don’t understand is why there is no way to change font size system wide, or why app developers don’t provide that facility. Yes I know that you can switch on zooming, but honestly – have you tried using zooming on a phone? My wife uses screen magnifying software at work, so she’s used to that – but she can’t get on with the iPhone implementation & I can understand why. It’s awful. There’s also Voiceover. This must be a massive boon for people with incredibly poor eyesight but for most users it’s not appropriate, who wants their texts or other private data read so that others can hear it? I’m sure many iOS developers have come from a web background & will be familiar with WCAG. As far as I know there’s no similar guideline for developing accessible apps, but a developers are still obliged to ensure that their apps comply with disability discrimination legislation such as the UK’s Disabaility Discrimination Act. The act says that service providers (and as a developer that’s you) must “make reasonable adjustments to ensure blind and partially sighted people can access your service”. So for a moment, let’s just pretend that WCAG does apply to smartphone apps and look at guideline 1.4.4 1.4.4 Resize text:Except for captions and images of text, text can be resized without assistive technology up to 200 percent without loss of content or functionality. (Level AA) That seems like a reasonable aim to me. I have spoken to a couple of developers about this, the general consensus seems to be “I’m not sure if that’s possible” or “it would be an awful lot of work for not much benefit”. This makes me sad. Not being an iOS developer myself, I don’t know if it would be possible for someone to write a text resizing library that they could open source? If it is possible, think of all the people that could be helped by including that in apps. After all, it’s not jst cronicly badly sighted people that struggle with small text, many older & long sighted people do to. I’d be really interested to hear other people’s thoughts on this, especially from the Dev community. I’ve blogged about books in the past, but these have usually been work related books that I’ve read. This is a work of fiction that, as yet I haven’t read. I have been a fan of Douglas Adams’ The Hitchhiker’s Guide to the Galaxy “trilogy” since I was about 12. I remember lying in bed listening to the radio plays on a crappy old transistor radio and I’ve read the books more times than I should probably admit. So when I heard that Eoin Colfer had been asked to write a sequel to Douglas’ books, I wasn’t sure if liked the idea or not. 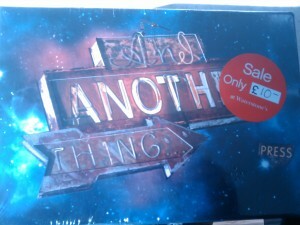 I certainly wasn’t going to rush out and buy it. Yesterday I was in Waterstones in Brighton helping my eldest daughter spend a book token she got for her birthday & I remembered that I had a voucher to spend too. I wandered in to the science fiction section, saw the Douglas Adams books & tried to rememeber the name of the guy that had written the sequel. I couldn’t think of it, so I spoke to a member of staff who said “oh that’s Eoin Colfer”. They didn’t have any of the hardbacks in stock & the paperback isn’t due out until the end of may. What the did have however was a few copies of the a numbered limited edition version of the hardback. This little beauty had previously been on sale for £100 but was now reduced to a mere £10! As soon as I saw it I new I was going to be buying it. 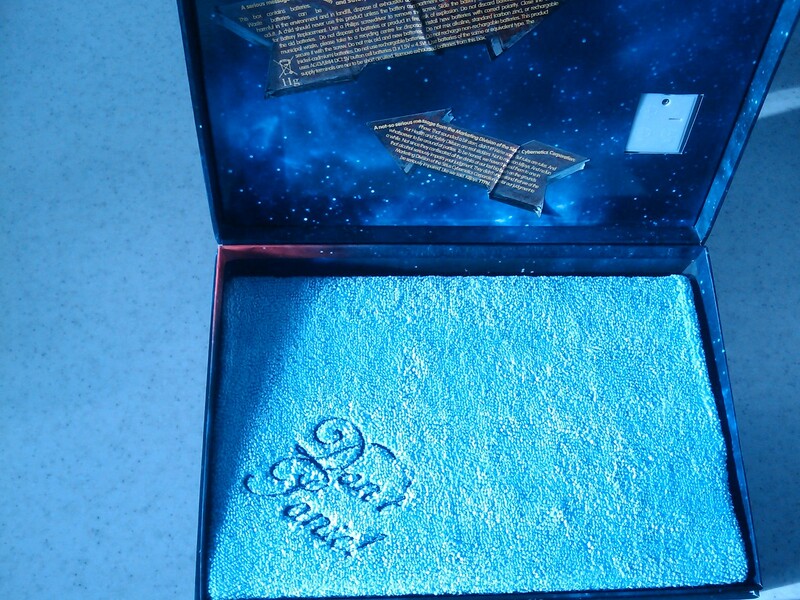 It’s a heavy card box with fake faulty “neon” lights built in to the front that spell out the title of the book. 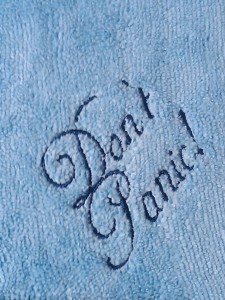 Inside there’s a hardback copy of the book covered in a duck egg blue towel with “Don’t Panic!” embroidered on it in large friendly letters. This is a must have item for any Douglas Adams fan’s bookshelf & there’s only a few left, so if you’re near a waterstones I suggest you go and grab one now. I doubt they’ll hang around for long at that price. When I get around to reading the book I’ll try to do a post & let you know what I think of it. They forecast snow but it looks like hfail. Just over a week ago twitter and facebook were buzzing with news about a competition that Nokia were running to bring snow to five UK towns. The way to make your town to win was to get the most votes. Welcome to Nokia Music Store. Enjoy the music you love on the move. This email is to confirm that you’ve successfully joined the Nokia Music Store. Your username is *******. You will need these details to access Nokia Music Store, so keep them safe. The thing is, no one knew they were registering for the Nokia music store when they entered the competition. Why had nokia registered people for a service without telling them? This is not good for trust. More time passed. Then, Yesterday an email arrived “You’ve received this because you entered the Nokia Win Snow competition, and you’ve been selected for special VIP tickets to your town’s event!”. The email linked through to a survey which asked which session you wanted to attend and how many tickets you wanted. After completing the survey users were dumped back to the Nokia Christmas website with no idea what was going to happen next. When would the tickets arrive? How would we get in to the event? Everyone settled down to do a bit more waiting. Thank you for the overwhelming response from Worthing to the email we sent out! We’re sorry for any confusion we’ve caused over the wording of the email and the instructions we provided. Unfortunately we can’t reply to you all individually to explain the process, so we’ll outline it in this email. By filling in the online form you’ve registered your interest in getting tickets for the event. Worthing Council have informed us that we can only have a maximum of 500 people at each session, so we’ll have to limit the attendees to a fixed number of invitees and a limited number of guests for each invitee. If you didn’t fill in the form in time and the form was closed, I’m sorry, but we have had to limit the number of applicants. We’re going to randomly select a number of invitees from all who applied, and send them an email to confirm that they are invited to the event, how many guests they have, and what they need to do to gain entry. We’d love you all to come, but unfortunately the response has been so overwhelming that we will be unable to fit you all in and still comply with the Council regulations. If you didn’t complete the form fully or correctly, for whatever reason, I’m afraid we can’t include you in the draw. Owing to the large numbers involved, we cannot engage in individual correspondence over any particular entry. Oh dear, oh dear. This will never do. Almost immediately irate Worthingites started tweeting their frustrationat Nokia, swapping details of conversations with officials from the council (who denied any knowledge of any restriction on numbers) and planning to demonstrate outside the event on Saturday if they didn’t get the tickets they’d been promised. So, Nokia underestimated how many people would want to come to the event, having voted for it. and they underestimated how angry people would be when they were told they couldn’t go after all. Faced with the prospect of snatching defeat from the jaws of victory Nokia have done the only thing they can to mitigate a barrage of bad publicity. I hope that Nokia’s underestimation of people’s expectations doesn’t lead to an anti-climatic event on Saturday. It’s not a new lesson really. If you promise the public something make damn sure you can deliver it. The difference now is that if you don’t deliver on your promises social networks mean that people can very quickly rally together and cause negative publicity and that will bite you on the arse.